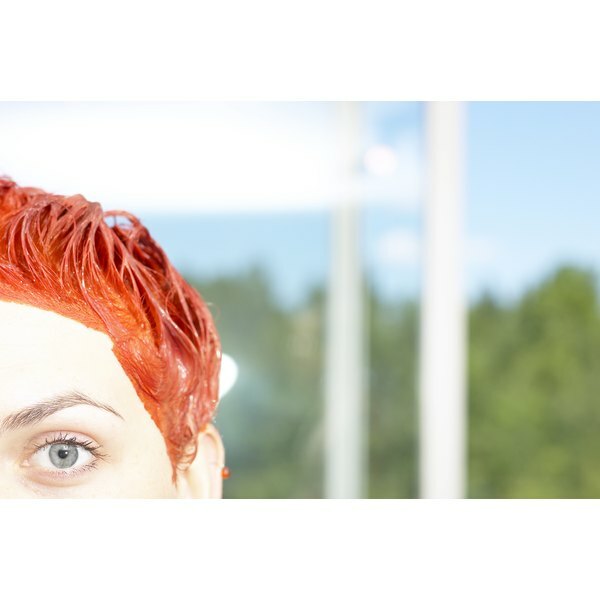 Color correction involves a lot more than slapping on a different hair color and hoping that it turns out well. Every color that you put on your hair counteracts or enhances previous hair-color applications. You may want chestnut-brown hair, but you'll keep getting burgundy or auburn hair if you don’t counteract the red that's already present in your hair. Red is counteracted by green- or ash-based colors. Chestnut brown is a warm color, meaning that it possesses warm or red undertones. Placing a warm color on top of red color enhances the red tones already present instead of counteracting them. Pour 2 oz. of an ash-based color into the color bottle. Add 2 oz. of 10-volume developer to the mix, screw on the lid and shake vigorously until well blended. Remove all of the tangles from clean, dry hair using a brush. Put on latex gloves. Apply hair color along the hairline around the entire head by squeezing out a small amount of color directly onto the hair and working the color into the hair with your fingertips. Apply a strip of color down the center of your head from the front hairline to the back hairline; work the color into the hair. Create a similar strip of color from ear to ear so that the hair is divided into four sections. Apply color to one section at a time, using 1/2-inch subparts. Carve out a 1/2-inch section and apply the color from root to tip, working the color into the hair with your fingers. Repeat until all of your hair has been thoroughly saturated. Set the timer for 20 minutes. Rinse your hair completely. Shampoo and condition your hair. If you're trying to go lighter, you can't use hair color to do so: Hair color will not lift hair color. At best, you'll end up with more red highlights in your hair. Going lighter also results in red tones naturally. To go lighter, use an ash or beige hair lightener and follow up with a beige-based toner.